I can't believe it's already time to study for midterms. Where does time go? 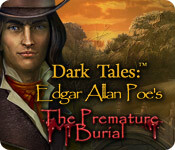 I managed to sneak in some time to play part of Dark Tales: Edgar Allan Poe's The Premature Burial. Is this a dark and ghastly game? Totally. Although, the whole "buried alive" bit might even be too much for me I continued on. You are not by yourself, your companion on this trip is an incredibly handsome detective and even Anne was drooling over him. So, we get a little engrossed in our work, sue me! After your carriage breaks down and all the little horsies (yes, Anne, I know that is not really a word, deal with it) run free, you are stuck. So you wander into town where you keep being met by a specter. The word specter is so much cooler than ghost, don't you think? Anywho, this specter keeps sabatoging your efforts to help find some woman who was buried - I think alive. The graphics rock. The ambiance is bone chilling at times. The game play is like most newer hidden object games, part adventure, part hidden object. The hidden object scenes are well done, but not incredibly hard. The one puzzle I found wasn't very complicated, but knowing these games, there is probably a nice mix of difficulty. Do I want to play this game? Yes, yes I do! Should I write a guide for it? I think I might! First things first, I must study, and then I can go back to the hunk, erm, great game. Ciao!